SOLD I dug this out today and remembered that we opened our show at Disney in 1989 with this Force 10 with a 100 foot tubular tail and towed behind a ski boat on the lagoon at Epcot Center.It is definitely well used but still in rather good shape considering the number of times it was flown. There is one wing batten that is missing the attachment bungee cord which can be easily repaired. (see photo) The sail is still brilliant. All the spars are in good shape and no rot on the bridles. The cross strut cotter pins are a little rusty, but still fine.I have know idea its worth, but I would be satisfied with $200 + shipping OBO.Please someone let me know your thoughts on the price. Not sure? Got one thnx! 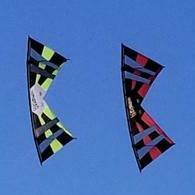 Wanting to buy a used Revolution kite! Eyeing a 1.5 B-series, midvent, 3wrap. Since it's gonna be a first ever quad, I'll also be looking for handles and lines. Preference for local deals so we could meet up and skip the hassle of packing for shipping and all that extra effort. Feel free to PM me too, thanks all and really appreciate it! Also looking for any 1.5 style rev (Reflex, Classic, vented, etc.) If you're thinking of letting one of your revs go, pm me please! Has to be RTF.